These portable sausage biscuits are a spin-off of my Better than Red Lobster Biscuits that everyone loved! I added less coconut flour and more cheese. I also made them bigger so that they could easily be popped into your toaster. Using a wide mouth toaster to reheat these biscuits makes them taste like they came out of the oven. Make a double batch and store in the freezer for a lazy morning (I have lots of those)! These would be great for breakfast, at home or on-the-go. Also, use these biscuits as buns for a juicy hamburger. Feel free to use a smaller scoop for a smaller biscuit, just be sure to reduce the cooking time. Oh, and be sure to make a double batch and stash some in the freezer. 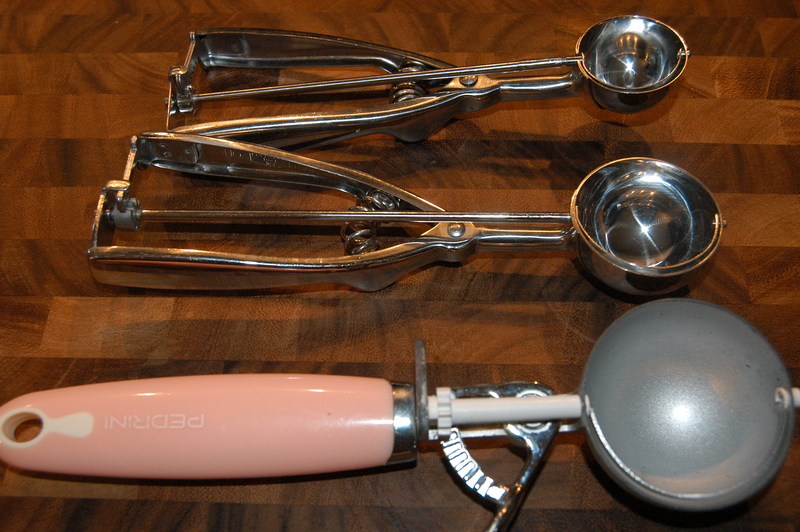 I love my scoops! Really, I use them a few times a day. I have a small one (1.5 tbsp) that I use for everything from small cookies to meatballs. My medium scoop is 3 tbsp and I use it for my Better than Red Lobster Biscuits (makes the perfect size), measuring the filling to make my mini cheesecakes, or making a slightly bigger meatball. My large scoop which is 4 tbsp I use to measure the batter for cupcakes, BIG meatballs, salmon patties, hamburgers, buns and anything else I need to scoop! These are a GREAT investment! Great deal on 2 seasoned cast iron skillets ($4 coupon today)! I cooked these in a large cast iron skillet but you could also use a muffin top pan. Also, feel free to also use bacon, ham or even leftover chicken. Even add your favorite dried herbs! Preheat oven to 400 degrees F. Add ALL the butter to large cast iron skillet and place in oven to preheat as well. In a medium bowl, add almond flour, coconut flour, baking powder and salt and mix. Then add eggs, buttermilk, cheese and sausage. Stir well. When oven has preheated and butter has melted, stir melted butter into biscuit mix. Use large scoop to scoop out dough into cast iron skillet. Bake for 18-20 minutes or until bisucits start to brown on top. Remove from oven. Allow to cool for 5 minutes before removing from pan with small spatula. Cool on wire rack. Store in fridge or freezer. Pop in toaster to reheat (like this wide mouth toaster). Nutrition information obtained from http://caloriecount.about.com. These sound great, and so easy. I do not have a large cast iron skillet, but I do have a ceramic baking sheet. I hope you enjoy Beth! Hi Brenda, you can cut the cheese out completely, It’s not important for the structure. You can use canned coconut milk for butter milk. Surprising coconut milk doesn’t taste like coconut milk when used in a recipe. Or add extra egg and add 2 tbsp of water, should work out fine. Keep me posted. Thanks Melissa! I’m going to make these this weekend! Hi Melissa !! I just pulled out your cookbook and was planning on the Better than Red Lobster biscuits that I have made many time and totally love — however you have inspired me now to try this recipe. I am thinking it would work out ok if I use my muffin top pan ? Thanks for the suggestions above regarding going dairy free and using coconut milk. I can tolerate a little cheese however I do sub coconut milk most of the time and it does work just fine. So I’m a huge fan of your sausage ball recipe. They satisfy the sausage biscuit craving. I was excited to see this recipe pop up. 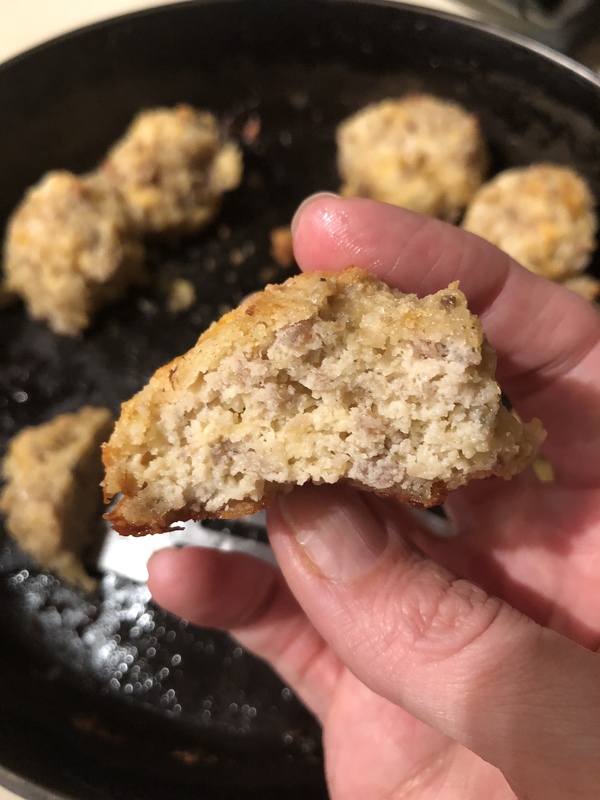 I made it this morning and made the mistake of not reading the entire recipe and instead of cooking the sausage, I added it raw (like the sausage ball recipe.) I went ahead with the recipe and baked them as directed although I made them smaller than recommended. They were fantastic! So yummy! Even more like a sausage biscuit. I don’t know anyone… even gluten eaters who wouldn’t gobble these up! I can’t decide if I want to try according to the original instructions or not. Not sure how doing it with cooked sausage would change the outcome. I’m all about fewer steps. I baked mine at 400 for 5 mins (to get the crispy browning) then turned the oven down to 375 to to bake through. They had a nice texture and were moist. Like I said I used a smaller scoop to ensure they would cook through. Thanks for another fantastic recipe… even though I screwed it up! Thank you for the feedback Chloe! Yeah, I’m all about illuminating steps to so I’m glad it worked out for you! I wonder if it would stay or bake the sausage even in the bigger biscuits. I really do like putting them in the toaster to reheat. Thank you again for the feedback! These look really good however, I can’t have almond flour. Can I substitute with a 2:1 ratio of GF AP flour and Sorghum flour? Honey, I am not sure, I’ve never used just a generic gluten-free flour. Try it maybe use a little less and see what the consistency is. I think if the consistency is right, it should work. Let me know. These are really excellent. I like to freeze a batch for lunches and eat with sour cream and salsa or Keto strawberry jam. Such an easy recipe also. Thanks so much. I’m glad you have enjoyed them Melanie!